With just over a week until Election Day, incumbent Ted Cruz continues to lead his Democratic opponent Beto O'Rourke. U.S. Sen. Ted Cruz, R-Texas, leads El Paso Democrat Beto O'Rourke by 5 percentage points, according to a new poll from Quinnipiac University. 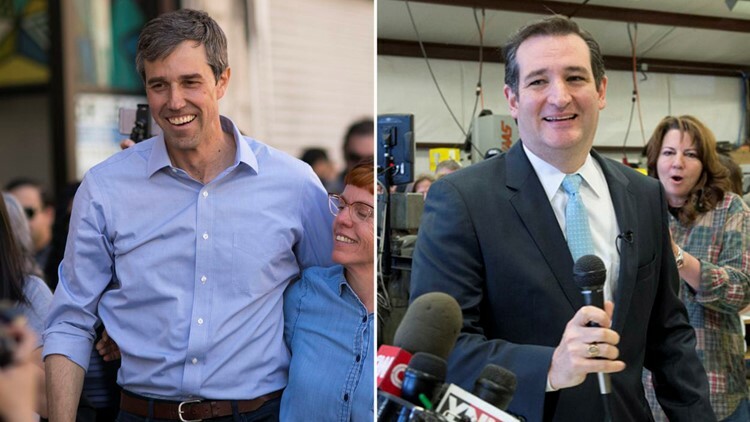 The poll, released Monday with just over a week left before Election Day, found that 51 percent of likely voters favor Cruz and 46 favor O'Rourke, with just 3 percent undecided. Early voting in Texas is well underway, with numbers at historic highs that have given both campaigns reason for optimism. Nearly all polling of the unusually competitive U.S. Senate race in Texas has found Cruz leading. A University of Texas/Texas Tribune poll released last week found a similar margin of 6 points. Quinnipiac's last poll of the race, released Oct. 11, found Cruz leading by 9 percentage points. This week's poll was conducted Oct. 22 to 28. It surveyed 1,078 voters with a margin of error of 3.5 percentage points. The poll showed bigger leads for Gov. Greg Abbott, who has maintained a large margin over his Democratic challenger Lupe Valdez, a former Dallas County sheriff, throughout the race. Abbott had the backing of 54 percent of likely voters to Valdez's 40 percent.